New Zealand Lotteries Commission promotes, organise and conduct lotteries; make rules regulating the conduct of these lotteries, and; advise the Minister of Internal Affairs on matters relating to lotteries. A set of two illustrations for Instant Kiwi lottery tickets for Christmas were required. 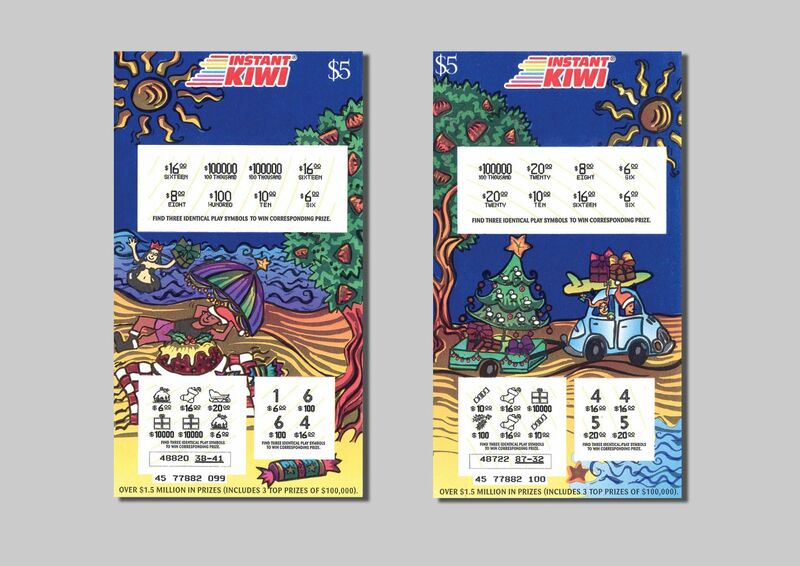 Project: Illustration for a set of two Instant Kiwi scratchy tickets. Brief: The theme was to be based on a Kiwi Summer Christmas they wanted a fun style with a New Zealand theme. Solution: The first illustration was a kiwi beach picnic scene, the second was also set at the beach but had a Volkswagen beetle towing a trailer with a Christmas tree with a surfboard on the top.